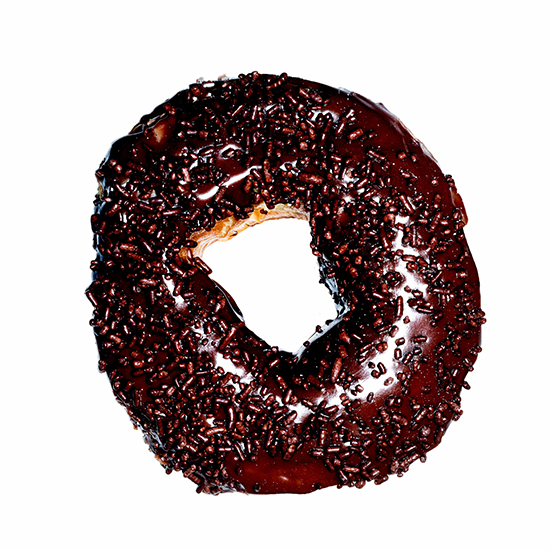 Boston magazine just released a Cheap Eats issue and getta load of this doughnut. Boston magazine just released a Cheap Eats issue for February and there are lots of fantastic finds called out by editor Leah Mennies. The guide is organized from A is for Allston to Z for zhoug ("Yemen-born hot sauce"). Pictured here: a sprinkled beauty from Demet's Donuts in the suburb of Medford. Quote: "For a chocolate-frosted blast from the past, we turn to the other DD, where doughnuts start at $1.20. That said, the family-run bakery has also managed to keep up with the times: Enter the new maple-bacon doughnut, a custard-filled, syrup-frosted confection topped with two sizzling strips ($3)."